If I enable xdebug by settting xdebug.remote_enable=1, the apache server becomes very slow; once I change the setting to 0, it's normal. I checked there's nothing under /tmp/xdebug folder. When xdebug remote debug is enabled and I enable debug listening in PHPStorm, it takes a short while to stop at the breakpoint, but not as slow as disabling phpstorm debug listening. My environment is: php + apache + xdebug on local centos VM, my mysql db and PHPStorm are on Windows desktop for development. MySQL is not slow. solved the problem completely. xdebug connects only when debug cookie is present. Please note you need to remove the debug cookie/param if you are not in debug session for this fix to work. Here is my config that I use to setup xdebug. Experienced also low performance with XDebug (loading Captcha in 6 seconds instead of milliseconds) Remarks on this page got me on the way to identify the cause. Turned off the profiler and loading time was divided by 3. Still slow, but better already. First double check xdebug.remote_autostart is disabled to avoid the auto connection. As @LazyOne pointed out, and @Tomáš Fejfar explains as well. But!... I still get very slow response (60 sec. timeout) from the server when the cookie was manually activated. If enabled, the xdebug.remote_host setting is ignored and Xdebug will try to connect to the client that made the HTTP request. It checks the $_SERVER['REMOTE_ADDR'] variable to find out which IP address to use. Please note that there is no filter available, and anybody who can connect to the webserver will then be able to start a debugging session, even if their address does not match xdebug.remote_host. So all calls to the server was trying to be debugged, making the server very slow and also insecure. Disable this option and and verified that I had well-defined xdebug.remote_host pointing to my machine, I got an acceptable response ~1sec. and only when the cookie is enabled. I am using PHPStorm 7.1 and the Apache server installed by Xampp 1.8.2, all that under Windows 8.1. I did experience slow interoperability between Chrome and PHPStorm in debug mode when having breakpoints set. Speed was notably improved by installing the last version of the XDebug dll (use the XDebug wizard to determine which version to download), copy the dll in your php/ext dir and change the php.ini so the new XDebug dll will be loaded. Stopstart Apache and see the difference. I could verify that a similar performance gain occured when debugging a webapp with Eclipse (Juno with PDT) using the internal Eclipse web browser. Also, if you do want to leave xdebug.remote_autostart = 1 enabled all the time, in your Phpstorm settings try increasing the max simultaneous sections. This should reduce hanging and blocks, but will still result in a performance impact based on my experience. Then have a look at /tmp/strace.log and see where the slow down happens. In my case low performance was caused by having 200+ breakpoints set in PHPStorm which were evaluated on every request by xdebug. Clearing those breakpoints in PHPStorm increased perfomance from 60 sec to 6 sec per request. Sometimes if you have other services working in the port 9000, Xdebug will not be able to connect to his server at the port 9000 and it will make it slow because it will get timeout on every request. Not the answer you're looking for? Browse other questions tagged xdebug phpstorm or ask your own question. 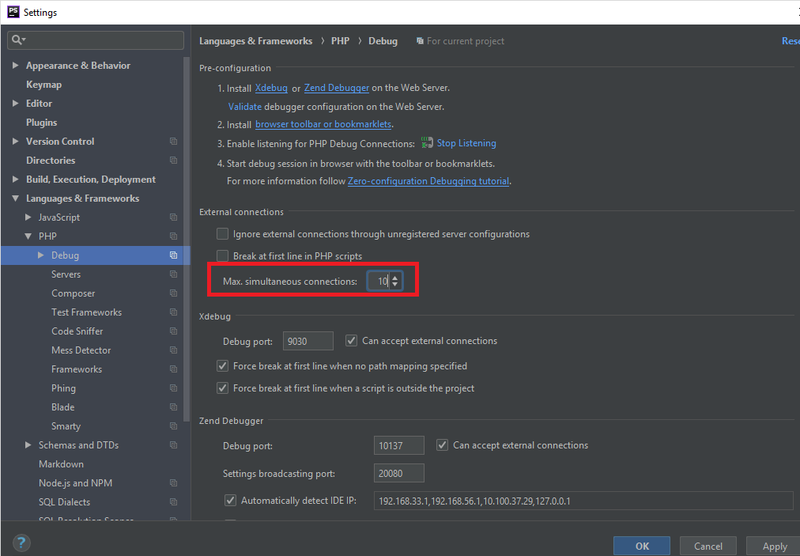 Xdebug PHP 7.1 PhpStorm remote server with Docker. How?